Many suits have been brought in United States courts as a result of sun glare obliterating traffic control devices or oncoming vehicles or pedestrians from view. Multiple terms have been used to describe this situation, including disability glare, veiling glare, sun blindness, and sun dazzle. The effect is to ‘wash out’ the image on the retina with a bright, overwhelmingly dominant spot or pattern. 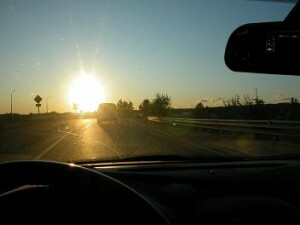 Evaluation of sun glare requires factoring in latitude and longitude, road direction, weather conditions, vehicle size and type, driver position, time of day, windshield transmission, whether the driver was wearing sunglasses, and any other parameters that could affect line of sight. It turns out that on a bright, sunny day or a clear, starry night, you can still face danger behind the wheel. There are a number of ways you can reduce the danger. They could save your life or someone else’s.We all know it’s dangerous driving in the fog and rain. But even when the weather is picture-perfect, as the sun rises, moves across the sky and then sets, many drivers are suddenly discovering that they’re driving blind either because there’s too little sunshine or too much. No one keeps precise numbers, but police say blinding glare like this is a lot more common and deadly than most people realize. In California, a bus driver with sun in his eyes hits and kills a little girl. In New Jersey, a man blinded by the sun drives smack into an oncoming train. And in New York, glare is blamed when a truck driver accidentally hits a woman crossing the street. Some cities are so worried, they’re putting up new warning signs. LED Glare is especially bad in the early fall and early spring . That’s when the sun rises almost exactly East and sets almost exactly West. Now, for all the streets that are laid out in an East-West pattern, that’s a problem, because that means that during the morning and afternoon commutes, you’re most likely to be driving directly into the sun. But the sun doesn’t have to be directly in your eyes to be dangerous. You can be blinded indirectly any time of the day by something called “veiling glare.” You know,those annoying reflections off the top of your dashboard. They dance across your windshield and obscure your view. Like a veil, you can see through it, but not very clearly. Well, avoid those popular vinyl cleaners that give your dash a high-gloss finish. Looks great, but they turn your dash into a mirror. And finally, to fight glare of all kinds, wear sunglasses made with polarized lenses. For you business owners that have drivers on the roads all season long,this is some thing to consider adding to your fleet driver training. If you don’t already have one in place, DefensiveDriving.com can create a customized corporate driver training course to teach driver safety.